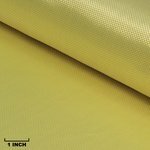 KEVLAR® fabrics can be used with, or as a great alternative to carbon fiber or fiberglass. Composites-grade KEVLAR is lightweight, impact resistant, abrasion resistant, heat resistant, and has great strength properties for the most demanding applications. 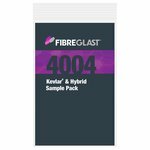 Fibre Glast only carries KEVLAR 49 fabrics. These fabrics are developed specifically for composite reinforcement. They can be used with epoxy, vinyl ester, or polyester resins to create a rigid laminate. 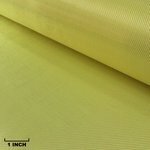 Common applications for KEVLAR 49 fabrics include: kayaks, canoes, high-speed boats, aircraft fuselage panels, pressure vessels, sporting equipment, wind turbines and much more. Scroll down for more general KEVLAR information. To learn more about specific products and pricing, click on an image below. KEVLAR® is a great choice for creating tough, impact-resistant parts. Keep in mind, it can be equally tough to work with when it comes to cutting, sanding, or machining. Fabricators usually select specialized scissors, like our Gingher® Modified Kevlar Scissors (2733-A), for cutting KEVLAR fabric. Scissors used to cut KEVLAR should be set aside to cut KEVLAR only. Don't use them to cut fabrics made from other reinforcement in the shop. 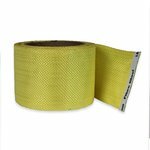 For finished parts that will require sanding or machining, consider using Kevlar in combination with other types of reinforcement, like carbon fiber or fiberglass. 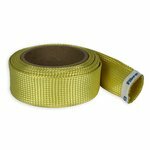 Fibre Glast is committed to ensuring that every roll of KEVLAR fabric we handle is First Quality and manufactured to the highest standards. That means you can expect the same properties and handling characteristics every time you order. 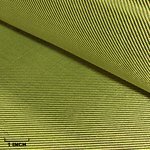 Want to learn more about KEVLAR fabrics? Fibre Glast has a free Learning Center with helpful white papers. You can learn more about KEVLAR® Fabrics with free white papers like: About Reinforcements and Fiberglass Repair/Composite Repair, or learn the difference between KEVLAR® 49 and KEVLAR® 29 with Fibre Glast's Blog post: KEVLAR®: Composites Grade vs. Ballistics Grade.